"Her worst nightmare had come true..." As improbable as it seemed, Gladys Aylward was certain God had called her to China as a missionary. But now, at age twenty-seven, she was being dismissed from missionary training school for failing her Bible class. Without formal education or a missionary organization to back her, Gladys raised her own finances for the overland trip that would bring her to the country and people that God had etched so deeply on her heart... China! What follows is an amazing adventure of faith and determination. 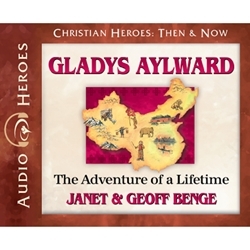 Gladys Aylward, a housemaid from England, dared to trust God in the face of dire and seemingly hopeless circumstances. Her life is one of the truly great missionary stories of our era (1902-1970).